Ammonia, NH3, is a tetrahedral molecule in which a nitrogen atom is displaced from a plane defined by three hydrogen atoms. In 1932, David Dennison and George Uhlenbeck at the University of Michigan made the first quantitative prediction of tunneling phenomena, that the nitrogen atom would tunnel back and forth through the barrier at a rate of 23 GHz. 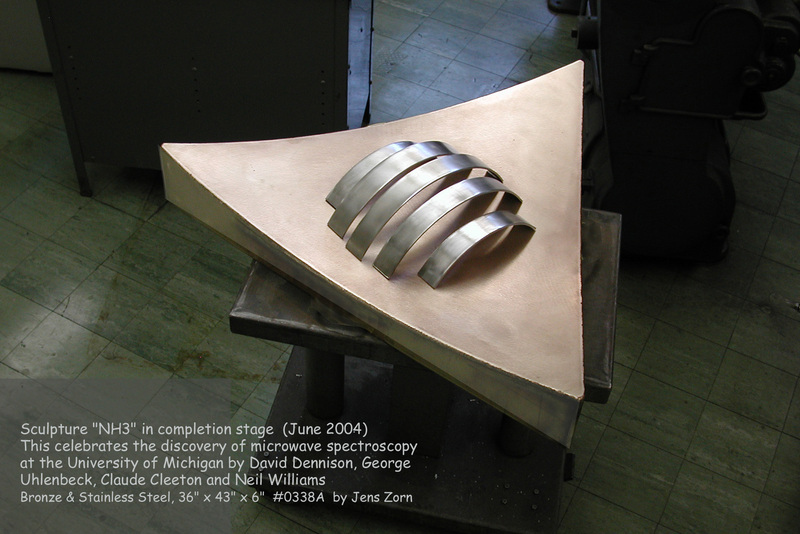 This bronze and steel sculpture at the University of Michigan depicts the incipient passage of the nitrogen through the barrier presented by the plane of the hydrogen atoms. In 1934, Michigan experimentalists Neil Williams and Claude Cleeton were able to see this transition in absorption of radiation generated by their magnetron oscillator, thereby becoming the first to use microwaves for spectroscopic measurements on atoms or molecules. In 1949, Harold Lyons, a Michigan graduate then at the National Bureau of Standards, used this narrow spectral line as the basis for the first atomic clock. In 1954, Gordon, Zeiger and Townes at Columbia University used this transition as the basis for the first demonstration of amplification by stimulation of emitted radiation, a process soon extended into the optical regime in the development of lasers. 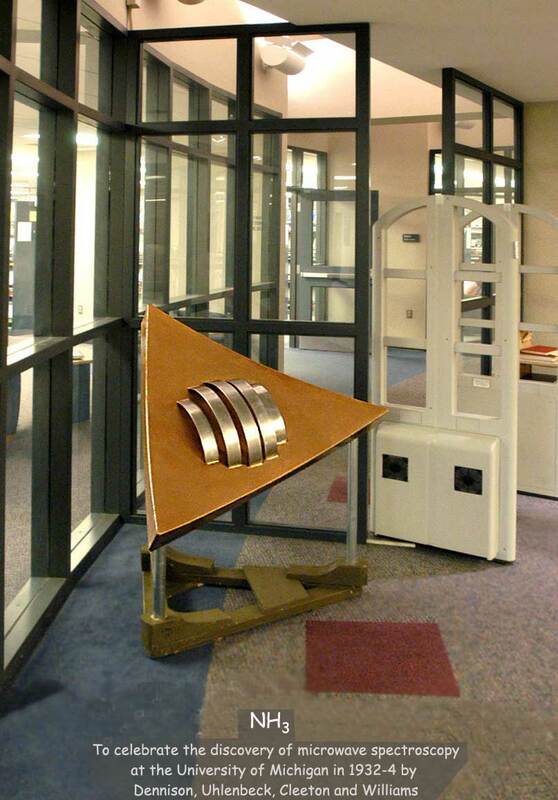 This sculpture was first installed in the Shapiro Library at the University of Michigan; it is later moved outdoors to the courtyard between Randall Laboratory and West Hall.